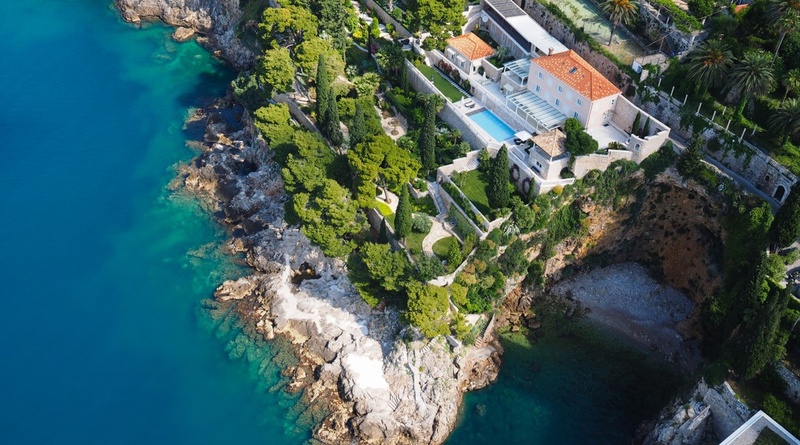 Villa Premium Dubrovnik is an architectural masterpiece settled on the edge of a cliff, in one of the most elite parts of Dubrovnik, only 500 meters from the Old town centre of Dubrovnik and just 5 meters away from the beach. This unique villa is definitely one of the most luxurious properties in the Dubrovnik area. With its incredible position, Villa Premium Dubrovnik offers magnificent views of the town and the sea and provides a peaceful and royal vacation. The villa was built to exceptional standards in ultra contemporary design while preserving the style and charm developed by the original architect and combining all the comforts of modern living. It benefits from the unforgettable views of the sea and a large Mediterranean garden surrounding the whole property. The main building comprises an elegant and spacious living and dining aa rea with fully equipped professional kitchen, indoor fireplace, stylish piano, library, SAT TV with entertainment system and modern furniture. The kitchen opens on to a wonderful covered terrace with barbecue facilities and an al fresco dining area. In any part of the day, this is definitely the most peaceful and relaxing area to enjoy the views and the stillness of the surrounding area. During the day, guests can gaze out to the shimmering Adriatic and during the evenings will be amazed by the stars and the city lights. Villa Premium Dubrovnik features a large, professionally landscaped and maintained Mediterranean garden, stretching all the way to the sea with direct, private access to the beach and a heated private swimming pool with counter-current, massage equipment and spectacular sea views.